When you hear about reading and parenthood, images of bedtime stories, picture books, and chapter read-alouds come to mind--the building blocks of literacy and establishing a love of reading in our children. But what about reading for parents? 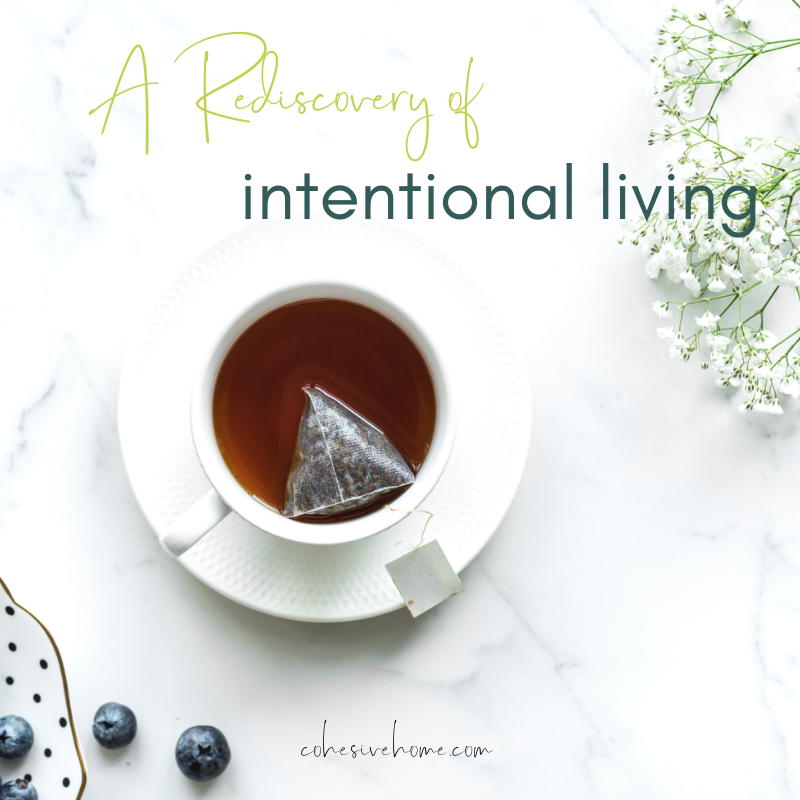 Living intentionally has been a concept that has been popping up around me for the past few years, it’s becoming a more mainstream way of life that helps us deal with the constant busyness prescribed by our culture at large. I thought this was a new concept that I would have to figure out and study, but as I delved deeper into the way to live intentionally I realized it has really been something I was raised in from a young age, I just didn’t have a name for it. Everyone has goals, but not everyone achieves those goals. In fact, research by Strava showed that most people’s goals for the new year fail by January 12. That’s less than two weeks! Two weeks of working towards something before giving up for the entire year. Ten years ago I was begrudgingly planning my wedding (I was not excited about the big church wedding it was shaping up to be), but more enthusiastically dreaming about the life that was just beginning. Matt and I would graduate from university in late April, get married in the middle of May, jobs and a place to live to be determined. We were facing the unique situation of immigration - I was born and raised in rural Pennsylvania, while Matt was from Halifax, Nova Scotia. I could not have known the adventure I was signing up for when my husband, Jason, and I married nearly 13 years ago. Add to that the joyful chaos of our two boys, Weston (7) and Ollie (3), plus our third miracle baby boy who will join us this spring. Over 15 years of studying spaces and working with clients, I have found that we live in a time where our homes, too often, are a source of stress, rather than the rejuvenation we desperately need. Our spaces cause frustration with the people we love most in our lives, rather than creating peace and ease. Do you ever have those days where your kids are bouncing off the walls, your home is in disorder, and you feel disconnected and overwhelmed? Whenever my family hits a rough patch, I run through the following list of questions to figure out how to strengthen the weak spots in our home’s foundation. Work through these questions whenever the peace has left your home or simply as a check-up to consistently create a more peaceful home environment. And if you’re the one struggling? Scroll down to the last section for some tips to jumpstart your own self-care. Although I always dreamed of living an adventure-filled life, it took me awhile to understand how music could fit into that. This is a piece of our story, and how we learned to take some fruitful risks to become full-musicians while raising three small children. Hi, I’m Brooke and I live in La Grange Park, Illinois, a suburb west of Chicago. I’ve been married to my husband, Josh, for 11 years and we have two daughters and an old mutt named Sadie, who we lovingly refer to as our Chicago brown dog. We left our beloved city a few years ago and live in a 1950’s Cape Cod across from a forest preserve which gives us new beauty with each passing season. I work two afternoons a week as a special education teacher providing reading remediation at a clinic and am fortunate to stay home with our girls the rest of the week. When my husband and I began a home renovation project a year ago, we both knew it would be tough. We both knew it would take longer than the contractors said, and we both knew it'd be fun. You see, we have a history of creating unnecessary challenges for "fun." We are not "home-renovation people." Our kind of fun was the short-term challenge of living differently. We are an eclectic little crew residing in Oklahoma City, OK. Brandon and I met while studying in Nashville, TN, and moved here for his Worship Pastor position after our 2009 wedding. Our daughter, Nora, showed up in 2012 to delightfully surprise us and challenge everything we knew about life. As a family, we love spontaneous dance parties at home, looking at pictures of Nora when she’s gone to sleep, dreaming, and having people over for YouTube video sharing. Brandon is a cyclist and Apple aficionado that convinced me to cilantro was worthwhile. Nora has begun Pre-K in our neighborhood public school this year, is actively trying to marry our neighbor, and tells a lot of potty jokes. For two years now, we have been an abstract painting mother-daughter duo. Last month, we moved into a new old house that we’ll be remodeling, but if that wasn’t enough, I stay busy pretending I’ll give up coffee and running my interior styling business + blog. Defining my design philosophy would actually be easier to hone in on by describing what it is not: I have no time for cold, sterile environments, brown and beige, overplayed trends, heirlooms that don’t feel sentimental, the phrase “pop of color”, formal for the sake of acting formal OR expensive for the sake of looking expensive, excessively large spaces or builder basic finishes. I beg for my spaces to ooze charm, invitation, interest, and enough order to dismiss life’s chaos. When we bought our last home (seen in these photos), my husband was a college pastor, and we hosted a large group of students regularly. Our values when looking for a home were to allow space for all to feel included, cozy, like they could put their feet up and for there to be a few conversation pieces upon an inevitable lull. When a kid entered the picture, I didn’t change these expectations for our home, as I find that no one enjoys stepping into clutter and plastic crazy town. Her toys were concealed in baskets, and her room provided a restful sense though certainly injected with whimsy. Furniture selections were made according to our modest budget, as well as the regular abuse to which they’d be subjected, leaving us to frequent Craigslist. This developed and cemented my love for vintage, storied anything. I can’t pretend we run around chanting a motto every day, but my biggest hope for our trio is that we embody LOVE. We are a family of faith, practicing open minds and hearts. Be this is displayed as hospitality, a listening ear, a late night glass of wine shared, or experiencing life’s simple pleasures with great gratitude, I do hope we give more than we receive. Physical and mental comfort so obvious that no one need announce it. One of my favorite things in the world is to see a pile of shoes by our front door — we don’t ask people to do this, but if they have sensed a level of belonging that made that feel appropriate, then we are succeeding on the most minute (but hugely important) level. Also, it ties in with nothing that’s been placed in the rooms, but I’ll forever cherish the memory of Nora’s birth at our home. Serving as evidence for the benefit of our home’s calm environment, we had the most wonderful experience delivering her there. Life feels nothing short of magical when I consider the moments this house has seen! My daughter has lived on the road more than half of her life. We moved into our first home on wheels when she was eight months old and now she is nearing two and a half. She learned to crawl in Colorado, said her first words in Texas and took her first steps in New Jersey. She celebrated her first birthday in Chicago eating deep dish pizza and cupcakes, her second dipping her toes in the Atlantic Ocean and playing boardwalk games in Point Pleasant. And while she likely won’t remember any of these things when she’s older, or the countless other things she has experienced, I know her early life traveling will shape the person she becomes. My husband and I chose a life of full-time travel because we were tired of living for once-a-year vacations. We wanted to see and experience the world around us. We wanted to be more thoughtful about how we chose to spend our time and how we raised our daughter. While taking the leap to live our life on the road was our dream it was also pretty damn scary. I would never really describe myself as a risk taker. I’ve always liked to follow rules. I spent over ten years working with children and families as a social worker, often talking to parents about things like the importance of consistency, routines, socialization, and age appropriate structured activities. Now here I am, choosing to raise my daughter in an environment that, on the surface, is anything but those things. Sometimes I wondered if we were being a little selfish. And in the beginning each time someone said something like, “Well you’ll stop when it’s time for her to go to school, right?” or “Oh no, she won’t get to take dance lessons” or “It’s too bad you don’t have room for more toys,” I questioned myself a little more. We have now been on the road for a year and a half, and while I occasionally do still have moments of questioning, I wouldn’t change a thing. I have learned that not only is traveling full-time not a selfish choice, it is the best choice we could have made as parents for our daughter. What I’ve experienced along the way is that travel is so much more than just seeing and exploring new places. It’s natural for people to first think about what my daughter may be missing out on by traveling full-time, but I like to remind them of all the things she gains. "I have learned that not only is traveling full-time not a selfish choice, it is the best choice we could have made as parents for our daughter." As we travel we share experiences as a family, which strengthen our bond. We play, discover and explore together daily. We face and overcome fears or challenges alongside each other while giving and receiving encouragement, problem solving and celebrating together. These shared experiences reinforce our relationship, affirming our positive attachments and add to our family story. My daughter may not have as many toys as other children but she has an ever-changing backyard to encourage her curiosity. There is always something to explore and learn about. Whether it is seeing a Bison for the first time or finding a piece of fallen bark, my daughter wants to know more and she is excited about it. Each day I see my daughter’s imagination grow. Her time outdoors, wandering new landscapes, opens up so many possibilities for play. Travel encourages us to allow her to be a child. It opens up opportunities for unstructured play in nature and reminds us how much children thrive from the freedom to just be little. While traveling we are constantly meeting and talking to new people. And while this can be out of my comfort zone, as a generally shy introvert, it can also be the most rewarding part of travel. It allows so many opportunities to model openness, respect and kindness towards others. When I am walking with my daughter and I hear her say, “Mama let’s say hi to that lady” or tell someone she’s never met before, “I like your shoes” as we pass them by, I know we are doing something right. Our home may have wheels, but it is still our home. It is a comfort and a constant in our changing environment. My daughter goes to bed in the same place each night even if she is somewhere new when she steps outside in the morning. She learns how to adapt to new environments and situations while always having the safety of her home. As parents we have learned (and are still learning) to balance consistency and routine with exploration and adventure, watching and learning how these things shape our daughter’s behavior. Travel has made us more attune to her needs, and has allowed her to practice flexibility and adapting to new situations. It allows for authentic practice of so many skills for us as parents and for our daughter that are invaluable. We learn to go with the flow when things don’t go as planned and cooperate while each doing our part to set up camp or solving a problem together. Travel builds independence and confidence while learning and trying new things and helps to sustain a child’s adventurous spirit. This life of travel has changed me both as a person and as a mother. I am more relaxed, adventurous and self-aware. I am far from perfect but I am a truer version of myself. I am content even on the difficult days. While I am not always the mother I hope to be, travel encourages me to be that person. It pushes me out of my comfort zone and creates opportunities to model skills for my daughter that I wouldn’t have as regularly in a stationary life. It challenges me and makes me stronger. At this moment we have no time frame set for life on the road. We will travel full time for as long as it feels like the right decision for our family and we are able to. I look forward to seeing how travel continues to shape my daughter as she grows, and myself as her mother. Whether we choose to travel full-time for another ten years or stop in six months, I know travel will always be a priority in our lives. It has become too valuable for it not to be. Jenn Norrell is a stay-at-home mama and social worker on pause currently traveling North America full-time in her 17’ Casita Travel Trailer named Betty White with her husband, two year old daughter and dog in tow. When not wrangling her spirited daughter or out exploring a new area, she can be found reading, crafting and always enjoying a cup of hot tea. You can follow her family’s adventures of tiny living on the road at tinyasscamper.com. We are a family of four living in Falmouth, Maine. We’ve moved frequently (our twins were born in Baltimore) and I consider myself a nomad at heart. We’ve been in this house for three years and although I love it, we are always willing to relocate for the right opportunity. Moving feels stressful to most people, but to me, it feels like an exciting adventure. Despite the fact that we move frequently, the concept of home is so important to me. Home is where we relax, make memories, and feel most comfortable. I have previously worked as a kindergarten teacher and an account executive for a marketing firm. I’m currently a stay at home mom. My husband, Phil, is an electrical engineer. Our twin boys, Ollie and Noah, are five years old and just started kindergarten this fall. What matters most is that your house feels comfortable and beautiful to you. I love meaningful art on the walls, soothing wall colors, and form and function together. I’m not afraid of bright colors. We have a small house which means lots of wall storage and only our favorite things are hung up. I’ve accepted that with young children your house can’t always look exactly the way you want it to. Kids are messy, and that’s okay. Our couch is old and not very pretty but we know we should wait a few years until the kids are older and stop spilling on it before we replace it. I’d like to believe we are adventurous and also intentional about how we spend our time. We love to be outside, especially at the beach in the summer! We choose time over money. We don’t really care about what is in style or about what other people are doing – we make decisions based on what is right for our family. I remember when I first stumbled across minimalism blogs when the boys were babies. Everything felt so overwhelming when they were newborns and simplifying my possessions seemed like a good way to feel more in control. I read “The Joy of Less” which really spoke to me, and started reading Courtney Carver’s blog and the Becoming Minimalist blog. I identified so much with what I read and that was the turning point. We moved from our townhouse in Maryland to a two bedroom rental apartment in Maine when the boys were two months old (which was insane in hindsight) and got rid of probably 1/3 of our possessions when we made the move. While we were never hoarders, we had stacks of full boxes in the basement that never quite got unpacked. When we moved again two years later, I simplified even more. Every time I got rid of something I felt so much happier. Our house is small. Not tiny, but much smaller than most houses in our town – about 1,000 square feet with another 250 square feet that is finished in the basement. When I walked in it felt like home. I was sure of it. The house was newly remodeled (we bought it from a neighbor who flipped it), with gleaming hardwood floors, lots of natural light, 3 small bedrooms and 2 full bathrooms. We have a nice big yard for our garden and chickens. There are so many benefits to small house living, and an important one for us is that this house was affordable (especially for our area) and allowed us to have a 15 year mortgage. The thought of being mortgage free by age 45 is very exciting. The house is easy to clean and maintain, and I love that it forces us to be intentional about what we own. Living in a small house also requires us to be creative about where we store things and how we arrange furniture, and I enjoy that. It is also very convenient – putting the laundry away is easy since the bedrooms are so close together, and I can cook dinner while the kids are in the bath and be nearby. Most of the people in our town live in very large houses, and sometimes I worry about the kids feeling inadequate when they get older. But even now, I have conversations with them about why we chose a smaller house and about the freedoms it allows us. I like to think they will understand. Our conversations and habits rub off on our kids. They watch what I do and they understand that we can’t keep everything forever. When they are tired of a toy they will ask me to get rid of it to make room for a new one. They love to give their outgrown clothes to a friend. A household should always be in flux because our needs are constantly changing. We donate to Goodwill at least once per month. Simple living is about being intentional. We are not stark minimalists by any stretch and there are often Legos all over the floor but we try to be intentional about what we buy, what we keep, how we decorate, and how we spend our time. We are no longer afraid to say no to opportunities that don’t serve us. The tone of our lives is therefore less hectic and stressful. That is not to say life is easy and stress free – life with small children never is. Of course we still have mornings when it feels impossible to get lunches made and the counters are cluttered and the boys won’t eat breakfast and toys are everywhere, but it is easy to recover. We have intentional free time in our lives for what matters to us. I feel lucky that I am able to be home in the summers and over school breaks to have fun with the boys and simple living has allowed us to do that. Our home reflects who we are and what we do. We have a nice big kitchen table that my husband built to fit the space and it is used constantly for art projects, games and meals. We keep art supplies on an IKEA rolling cart next to the table because they are used daily, and we can roll the cart out of the way when we have dinner guests. We have an old church pew from the church we were married in on one side so we could shift the table close to the wall to allow for a walkway. It is the area of our home that works the hardest and is used most often. We don’t have a dining room and we don’t need one. We have pictures on the walls that make us happy – the boys’ artwork, pictures of street signs of the previous places we’ve lived, coffee cups on hooks that are both functional and cute. The boys helped me design an eclectic gallery wall in their room that we all love to look at. We read every day so children’s books are always in sight. We are building a big deck that will allow us to have more people over in the summer since our house can’t accommodate many people. This is the first house we’ve lived in that has really felt like ours and it is because I have moved all the other clutter out of the way that wasn’t meaningful to us. Liz is a stay at home mom currently living in Maine. She loves small houses, warm weather, reading, running, decluttering, and adventures with family and friends. My family and I live what I call an indigo life. A life lived deeply in gratitude. One that is rich, wild, and abundant. I would love to say we have always lived this way, but like most of you, this kind of life sometimes takes work and definitely requires daily practice. Before living a life of abundance, we were always ok, but not very mindful of being thankful. We spent a lot of time going through the motions of life. Sleep. Eat. Work. Sleep. Repeat. Then, about five years ago we went through a tumultuous time with my wife’s family. We were in the process of buying the family business and there was discord among the family members. Every day was an emotional roller coaster for us. Hurtful words were spoken and relationships were severed. This went on for two years. For two years we cried, yelled, took it out on each other, but mostly felt raw. We were devastated. We tried to move forward and find joy, but neither of us knew what that looked like or how to go about getting it back into our life. We got a puppy and then took a vacation, but there was something still missing. By Thanksgiving that second year I was desperately looking for a reason to be grateful. I was searching for something to keep my heart from closing. I found the inspiration to create a gratitude tree in my front yard. There was a young oak tree with small, low branches. I put up a cardboard sign, threw some tags and markers into a old tool box, and made my puppy pose by the tree for a photo. Every day I would make my way out the tree and write down one to five things I was grateful for and then hang the tags on the tree. My neighbors took notice and they started to add grateful tags to the tree as well. Soon, there were several tags of thanksgiving blowing in the breeze. It wasn’t easy for me. At a time when I didn’t have anything positive to think or say, it was difficult to come up with something meaningful. Some days it would be as simple as I was grateful for toothpaste so my teeth wouldn’t rot. That was enough. I started to notice a shift in my attitude and big waive of relief came over me. I wasn’t really surprised in my attitude adjustment. After all, I knew enough to know that energy flows were you put your attention. However, what shocked me the most was that I had sparked a movement and didn't even realize it. The next year came and I was being asked to put up the gratitude tree again by my wife, friends and neighbors. The answer to my own pain had also helped others find their own joy. I started to see things differently. What I began to noticed in my relationships was that when I interacted on a negative level, the other person usually followed suit, leading us no where good. When I approached my interactions with others with a grateful heart, I made better connections, and built better relationships. In turn, they started to live with a grateful heart too. You are who you hang around. Since that time I have gone on to become a life coach, making it my mission to help others find their indigo life. Being a field guide for life has also helped keep me accountable because I firmly believe I have to live it in order to give it. I want my family to keep living an indigo life especially as it grows. A life lived in gratitude became a value for us when we realized we didn’t want to be surrounded by negativity any longer. We felt happier and more at peace when we stayed mindful about our words and actions, and from my gratitude tree experience, that behavior was contagious. This way of living became especially important about a year and half ago when our son was born. We want to raise him with a grateful heart, and it’s important to set the example for him. Children are sponges, soaking up language, energy, and meaning. He is influenced by what we say and it’s important to us that we model the habit. Even though he can’t communicate with words quite yet, we ask him what he is thankful for and we tell him what we are thankful for. It’s become a family ritual. We look forward to the day he can use his words to tell us. Today, when schedules allow, we take daily walks with our dog and son. Naturally, the conversation starts with events of the day. Sometimes it turns negative. but then one of us will stop and say, what are you grateful for today? Then it turns to our blessings and our time together as a family feels stronger. Another tool we use as a family and one that I use for my clients is called the Living Space tool. When we start to feel we are moving away from our indigo life, it’s a good indication we need to do some clearing. There is a philosophy that states our outer world reflects our inner world. Meaning, the state of our homes, work places and other spaces is a direct reflection on where our mental state is. In order for us to keep living a grateful life, our minds need to be free of mental baggage and focused on staying mindful. The tool is simple. Clear your space, clear you mind. Think of a space in your home that you don’t like. It may be a drawer, a closet, or an entire room. Make a list of what you don’t like about this room. How does it make you feel when you are in that space? Notice any body sensations such as anxiousness, etc. Next, think of a space in your home that you love. Again, make a list of what you love about it and how it makes you feel to be in that space. Now clean, declutter, reorganize, paint it, remodel, etc the space you don’t like so it reflects the space in your home you do love. You might notice that something you have had negative thinking around suddenly changes. Or a problem you have suddenly has a solution. This supports the minimalist mindset. Keeping around unwanted things in your life blocks you from joyful living. Although we celebrate gratitude all year, November is especially important for us. We still set up a gratitude tree and have encouraged others to do the same. There are gratitude trees in several states across the nation this year. Grateful living has really helped us and those around us focus on being present in our lives. Showing up and living in the moment rather than sitting in fear or worry about the past or future. It’s enough. What we have today is enough. I am grateful for Kate and Melissa and all the families that are a part of the Cohesive Home community. Abby is a life coach, gratitude warrior, and field guide for life in addition to wife and momma to one son. She believes everyone can live a rich, wild, and abundant life. They just need a little help getting out of their own way to make that happen. Outside of guiding others, she enjoys meditating, practicing yoga, taking road trips, sipping peppermint tea, and chronicling life in her journal. Her family lives on a small lake in North Texas. I wasn’t born an adventurous person. I am a homebody at heart. I love long quiet afternoons, naps, cups of herbal tea and getting lost in a good book. And for many years I hid in my home doing just that while building walls to protect myself from the “unknown,” which was nearly everything outside my front door. I married my high school sweetheart at nineteen years old, and we lived a very typical life together—working, saving money, dreaming of the 4 bedroom house we would build, the 3 car garage my husband would have, and the cars we would buy to fill it. I would tell you I was happy, but deep down I was afraid. I was afraid of traveling (even if that meant 20 minutes away), being uncomfortable, of not knowing what was coming next and anything that was unfamiliar. For the majority of my late teens and early twenties, fear became my master. And I obeyed, hoping that if I just insulated myself from all that seemed so frightening, then I could live and be happy. But that was a lie. I learned I could never insulate myself enough because there was always something new to worry about, something still unknown to be afraid of. Life was passing by around me and I had my front door firmly bolted shut. I was saying no. It wasn’t until after our first baby was born that things began to change. I had obeyed fear for many years at this point, and I was becoming worn out from its cruelty. I knew that something needed to change. I began to seek God. I began to finally ignore many of my fears and believe that I was loved just as I was. And then one day, I felt God asking me to let go of my fear of traveling. It was still something I avoided, but in that moment I had this picture in my mind of someone gently taking my tightly clenched fist and opening it up to receive something beautiful. And so, for the first time, I said yes, and I began to believe that I could overcome that fear. It wasn’t long after that when my husband approached me with news that he would be sent to Scotland to work for a few months. Scotland! Here was my chance to walk out my “yes,” even though I was still afraid. But for a few weeks that magical summer we lived in a little apartment near cobblestoned streets, old granite buildings and rich green hills. I couldn’t believe that me of all people traveled across the ocean and was walking around in another country! I couldn’t stop smiling. I loved the little shops near us, the cheese shop and the flower shop. I loved the library that was over 100 years old and I loved the little farmer’s market we visited one weekend. I loved the cold North Shore. I loved walking everywhere even though that meant sometimes lugging groceries and pushing a stroller in the rain. I loved that I had done what I never thought I could possibly do. And it was there I began to bud. It was there I began to receive that beautiful gift, me—fully alive, fully tasting, touching, living this life God had given me to live. Saying yes to all it could offer. I came home a changed woman. Fast forward four years. My husband and I were settled on a beautiful 2 acre country property living with another family, sharing close community, awaiting the birth of our third daughter. My husband had been working at the same company for 11 years. He had accelerated past his peers and had traveled and worked many long hours. He was beginning to see that there was no end to the working world. There were always more deadlines, more projects, and more problems to fix. He had started with the company when he was only twenty, and now those 11 years seemed to vanish in the blink of an eye. How could time pass by so quickly? We both realized we didn't want to waste any more time. We were ready for more of life, to really drink it all in, see what it had to offer. We were ready, to not just bud, but to bloom and thrive in the unknowns God had waiting for us. After a meaningful conversation one late night, we agreed: we were ready to leave all we had known behind to travel as a family, to grow into all we could be, to bond closer together, to store up meaningful relationships and experiences rather than things. We were wholeheartedly saying YES to a future free from fear, free from restriction and full of hope to live out what we truly cared about. After discussing all of our travel options, we knew we wanted to live on a sailboat with our children and travel together, hoping to one day venture into foreign lands where we could experience different people and cultures. We knew it sounded crazy. We knew people wouldn't understand. But we understood. We understood that there would be indescribable beauty woven throughout all the daily challenges we would face. And we knew there would be challenges: living in a small space, being dependent on the changing, fickle nature of the weather, learning a brand new skill, not having easy access to showers, washers or dryers, traveling with two small children and an infant, and constantly being surrounded by that which is unfamiliar. Everything would be new and different. But the challenge was part of the reason we were jumping in. We felt all too well the slow, silent atrophy of a life lived on autopilot. We knew a life lived intentionally held the space we needed to live out our values. And we knew it needed to be now. We weren't satisfied with "someday," we were ready to jump in, with hearts and hands wide open. We felt all too well the slow, silent atrophy of a life lived on autopilot. We knew a life lived intentionally held the space we needed to live out our values. And we knew it needed to be now. We recently spent three weeks on our 47' sailboat before traveling back home to finish the sale of our house and to pack up the rest of our belongings. And even through several days of inclement weather, leaks in our boat, and the chaos of moving, we loved what each new day brought for us. As someone who used to be afraid to venture outside my front door, I never thought I would love life out on the open water, but being there, I was often held in wonder and amazement. While on the boat, I love waking up to the water, birds in the air with the sun peeking out over the horizon. I love the coziness of the boat's interior and the creativity required to bring the family together. I love living kinder and gentler toward the earth. On a boat it becomes crucial to think about the impact we'll be having toward the sea and land around us. Thinking about where our water comes from and where it goes, the products we use the trash we produce—it’s a more than worthwhile challenge. I love seeing my children embrace change and new challenges. And I love the fiery sunsets that take my breath away every single night. I never thought this quiet, reserved homebody would grow up to be a wife and mama who embraced adventure and the unknown, but I can't think of a more exciting place to be. I know our decision to live and travel on a boat with our children will give us the space to live out our values in a truly radical way. Adventure, freedom, togetherness—I‘m saying YES! Brittany is a homebody turned adventure mama of three little girls. She and her husband Mike are currently transitioning their family to a nomadic life at sea on a 47' sailboat. Brittany loves following the radical call of God into a simpler life full of passion for freedom from fear for herself and others. When she's not homeschooling her girls, she's learning how to sail, writing on her blog, and enjoying the many incredible experiences of living on a boat.